Description: Bethlehem Rare Reissue Series! Bethlehem Records was established in New York by a Swiss-born Gustav Wildi in 1953, and released a wide variety of high quality jazz albums before it was sold in 1963. Not long after establishing the headquarters, Wildi opened an office in California and began recording on both coasts, which greatly contributed to the variety and depth of its cagalogue. 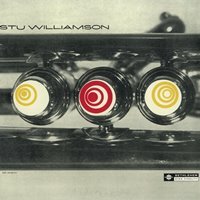 Stu Williamson, recorded in Los Angeles, is the trumpeter's second album for Bethlehem. Compared to the first album recorded with a quintet (with Charlie Mariano), the addition of Bill Holman and Jimmy Giuffre, both as player and arranger, made this album more interesting and exciting. Stu's technique is flawless, and he executes solid ideas with cool tone and smooth, flowing delivery. The superb rhythm section -- Stu's older brother Claude Williamson, bassist Leroy Vinnegar and Mel Lewis on drums -- propels the band with great momentum. Another great example of West Coast jazz! Recorded in Los Angeles on January 20, 1956. Mono. This reissue CD was released in Japan by Solid Records in 2013.